Joanna Januszewska and Rafal Wieczorek’s gorgeous custom family home is built to withstand the next 100-year flood. Lamps by Kate Spade, katespade.com; windows and doors from Lux Windows & Glass, luxwindows.com; floral arrangement by homeowner Joanna Januszewska; fireplace by Diamond Fireplace & Stone, diamondfireplace.com; Photograph by Jared Sych. There are many reasons a Calgary couple with a young daughter might want to move from the flood plains of Roxboro to a higher and drier neighbourhood. But even after being flooded out not once, but twice, in 2005 and 2013, moving out of Roxboro was still not on the agenda for Joanna Januszewska and Rafal Wieczorek. 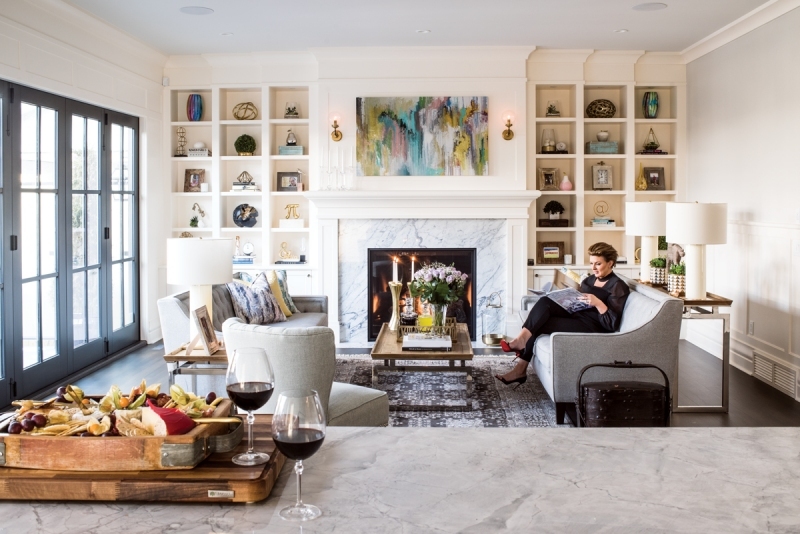 Instead, they built a new home in the neighbourhood – albeit one that incorporated the latest in flood mitigation along with the couple’s eye for European-Old World elegance. 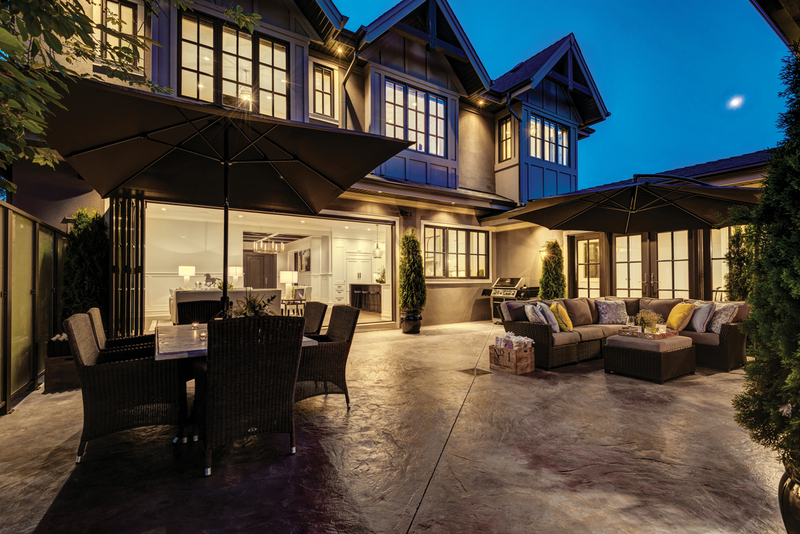 The couple are the co-owners of Niko Homes, a custom builder, now in its eighth year, that focuses on high-end homes. Wieczorek has a passion for construction and handles the building aspects, while Januszewska designs the interiors. While Wieczorek favours masculine materials such as rundle rock, Januszewska’s love for feminine details is reflected in the finishings. Their new home, which also acts as a showhome for their business, seamlessly blends traditional elements with contemporary architecture, right down to the most minute detail. It also reflects the couple’s European roots. 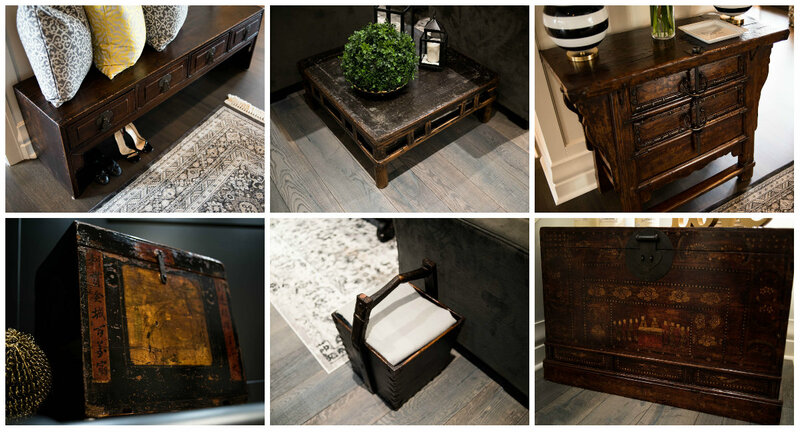 From the first step into the foyer you know you’re not in a typical Calgary minimalist-designed home. Instead, this home is richly detailed with nods to the couple’s past. One example of this is the faux coffered ceiling finished in a charcoal metallic paint that Januszewska designed for the foyer, which was inspired by the pressed-tin ceilings commonly seen in London, where Wieczorek lived as a teenager. The kitchen offers further evidence of European influences. Here, Januszewska used rift-cut solid white-oak flooring, large-scale lights that resemble gas lanterns and brass pulls on the cabinets and drawers. The apron-front sink and custom-made brass-plated range hood in the kitchen are reminiscent of a French country kitchen. In the pantry, Januszewska installed produce drawers fronted with mesh screens to allow for air circulation. “It’s something you see in the Old Country,” she says. Her choice of belle poque-inspired tiles in the butler’s pantry, downstairs powder room and utility room continues the heritage feel. Throughout the home, the couple used a custom-calibrated signature stain. Januszewska also had a built-in cabinet made for the dining room, modelled after the one her great-grandmother had in her dining room in Poland. 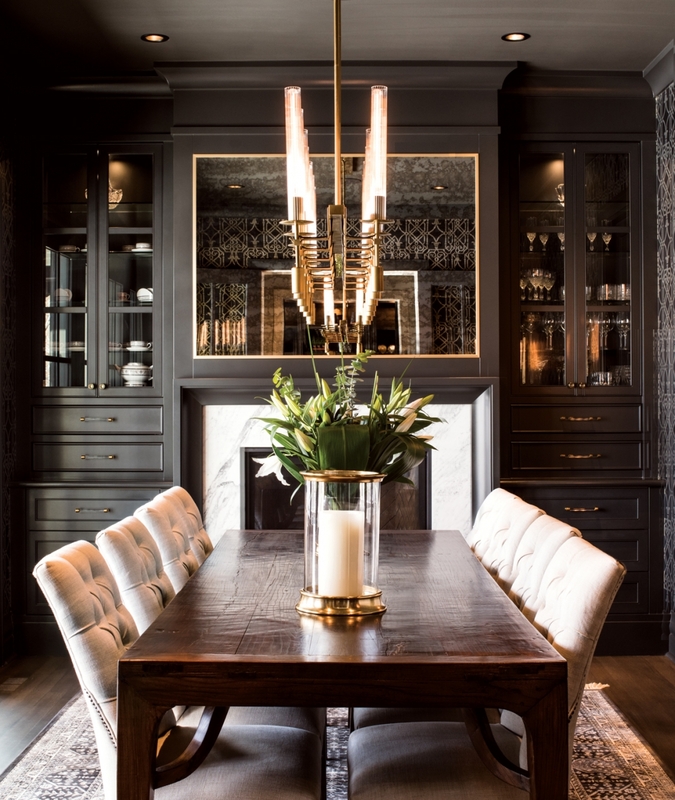 With its tiny drawers and smoked-glass antique-style mirror, the cabinet is indeed a special piece, although it had the potential to make the room look too traditional, so the couple paired it with a statement chandelier from Restoration Hardware for balance. Although new, the fixture’s tapered-glass cylinders suggest candles, further driving home the Old-World Euro vibe. 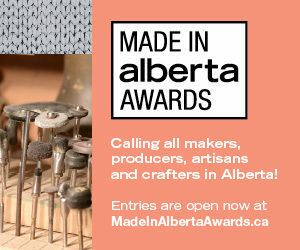 The home features several pieces of furniture from Inglewood antique store Hinchcliff & Lee. Photographs by Jared Sych. Kitchen countertops by Pacific Stone Fabrication; Wolf oven from Bradlee; Kohler sink and Grohe fixtures from Robinson Lighting & Bath Centre. Photograph by Jared Sych. Homeowners Joanna Januszewska and Rafal Wieczorek in the kitchen of their home in Roxboro. The five-by-10-foot kitchen island is stained in a custom-created colour called Charcoal Mist, which was used throughout the home. Dining-room table from Hinchcliff & Lee; chairs and chandelier all from Restoration Hardware; fireplace by Classic Fireplace; Mirror over fireplace by House of Mirrors; Candles from Pottery Barn. Photograph by Jared Sych. The dining room’s traditional details, such as the smoked-glass mirror over the fireplace and antique table from Hinchcliff & Lee create a sense of timeless elegance. Light fixture in office from Restoration Hardware. Photograph by Jared Sych. 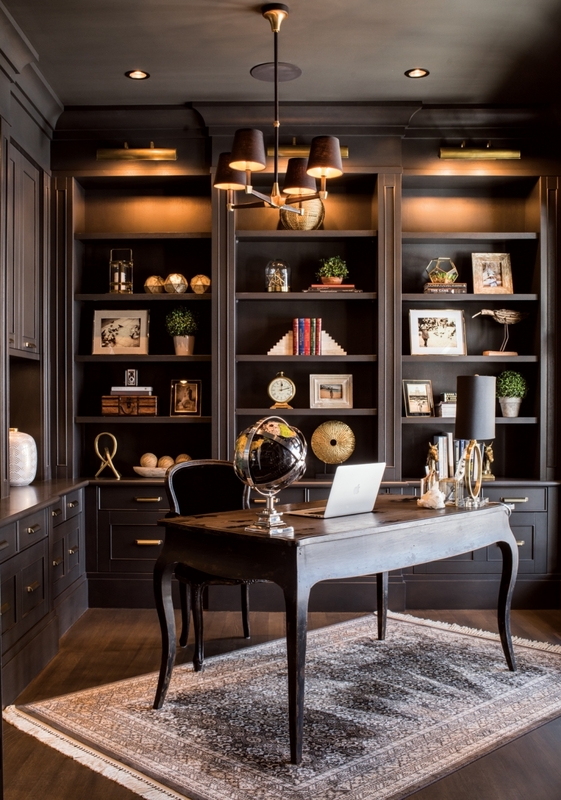 Januszewska’s office features custom-made shelving displaying a curated collection of family photos and treasured mementos. The desk and chair are antiques paired with a new light fixture from Restoration Hardware. Wine-room cooling system by Koolspace Wine Cellars; Wine-cellar bricks from Stone Concept; Chandelier and sconces in wine room from Restoration Hardware. Photograph by Jared Sych. 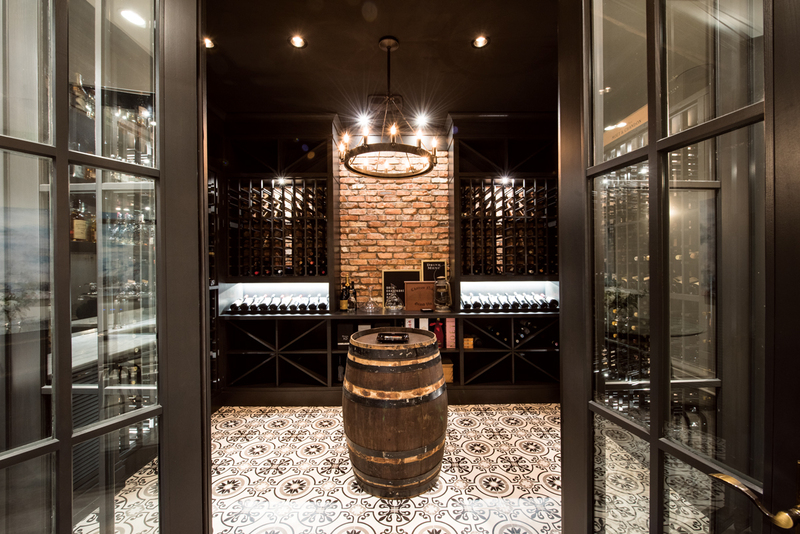 Perfect for holding tastings or smoking a cigar, the wine cellar/cigar room suggests an Old World European tavern with its tiled floor, cherry-wood shelving and a wine barrel imported from Italy used as a table. Bed frame and night stands in from West Coast Kids; Desk and lamps from Pottery Barn Kids. Photograph by Jared Sych. The couple’s daughter’s bedroom is painted in delicate mauves and creams and papered in a Parisian-patterned wallpaper from the U.K. The bed was formerly a crib, now converted to full size. Main-bedroom ensuite floor tile by Saltillo Imports Inc.; Aquabrass soaker tub, Kohler sink and tub fixtures and Steamist steam shower all from Robinson Lighting & Bath Centre; Countertop by Pacific Stone Fabrication; Chandelier from Restoration Hardware. Photograph by Jared Sych. With its ample clean-lined vanity and herringbone-patterned Carrara-marble tile floor, the main ensuite is light and elegant with its oversized Aquabrass soaker tub and tufted stool. All electrical outlets are discreetly hidden within the cabinets. An 18-foot wall of accordion doors opens the kitchen and den to the rear courtyard, which features a poured-concrete floor made to look like old stone. Photograph by Jared Sych.